Llamas can do a wide variety of jobs, but the following are the most widely recognized. Llamas are superb pack animals. A healthy full-grown llama in excellent condition can carry up to a third of its total weight for as long as eight hours - and that makes a llama as strong as, if not stronger than, a horse! Llamas have been helping humans transport goods through rugged terrain for literally thousands of years. The intelligence, calm disposition and exceptional trainability that made them invaluable to the ancient Incans crossing the Andes makes them the companion animal of choice for active hikers and trekkers today. 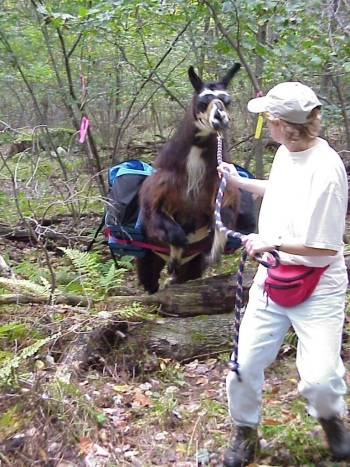 Most trekkers load their llamas with 60 to 80 pounds for a five to ten mile hike. In addition, llamas are extremely agile and can easily navigate very steep and twisting trails. Many of the finest trekking organizations in the nation rely solely on llamas as pack animals, citing their even dispositions and outstanding endurance. Llamas are also the best choice for trekking in fragile environmental areas, since their padded feet do far less damage than hooves. Because they're very efficient foragers, they actually do less damage to plant life than native deer. Their natural steady, even pace is great for hikers who accompany them, and llamas' innate neatness about their droppings (which are nearly odorless pellets, most often deposited in a communal dung pile) reduces fly and parasite problems for everyone on the trek. It also makes cleaning up after an encampment much faster and easier. Llamas make terrific guard animals. If you think the concept of a camelid guarding the flocks is silly, think again! Recent studies show that llamas make excellent guard animals, effectively protecting sheep, goats, miniature horses, and other small livestock from predators. Llamas can begin serving as guard animals at about two years of age and they can continue to do so as long as their health and stamina remain good. Both male and female llamas will naturally guard against predators.Some experts recommend that a llama used as a guard animal should not be used for other purposes, while others say even guard llamas can have multiple tasks in addition to guarding (such as pulling a cart, serving as pack animal, etc.). Llamas are great for pulling carts. Though we rarely think of llamas as draft animals, they are in reality exceptionally adept at pulling carts. Llamas can be trained to pull carts alone, or in a team. Special lightweight two-wheeled carts designed to be pulled by llamas are widely available and are a wise choice over standard pony carts, since the llama's stride is considerably longer than that of a pony. 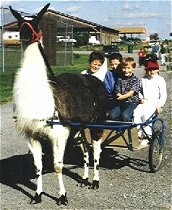 However, it is possible to drive a standard pony cart pulled by a llama if a special llama harness is used. Training a llama to pull a cart may take some time, but a well-trained llama can be a skillful and sturdy draft animal. Llamas may be trained to pull carts for pleasure driving or even to compete in obstacle course driving.